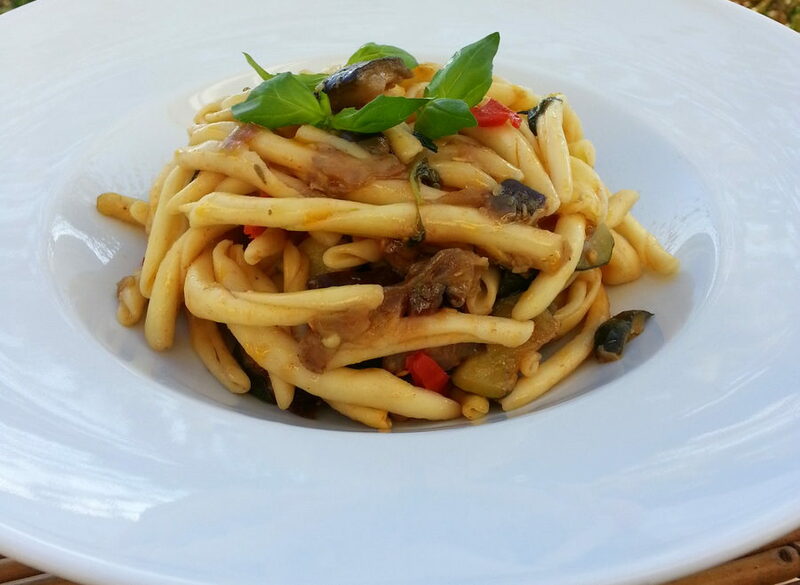 Fileja, the best Southern Italian pastas for heavy or spicy sauces! If you have never tried Fileja pasta and manage to buy it (or make it), do so. This is really is one of the best types of pasta for heavy meat or spicy sauces, especially when the pasta is fresh. 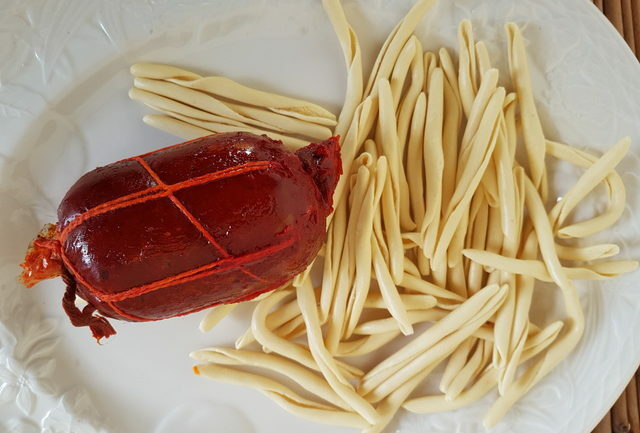 Fileja, also known as Maccarruna, Maccarruni or Filedda in the local dialect, is a typical Calabrian pasta of ancient origins, which originated in the Calabrian province of Vibo Valentia. Usually 3 to 4mm thick at most, and slightly light yellow in color, Fileja are shaped like a screw which has been elongated. Some people also refer to them as fusilli, but they are actually quite different in shape to the fusilli most of us know and eat. 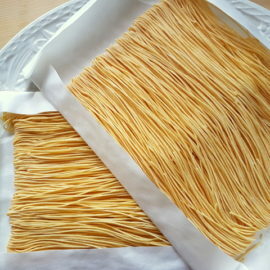 Fileja were and still are mostly eaten as fresh homemade pasta. They are made using a method which has been passed down from generation to generation. 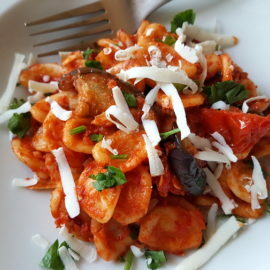 Like many Southern Italian homemade pastas, they were originally produced from poor and simple ingredients, just wheat flour, water and salt and no eggs. 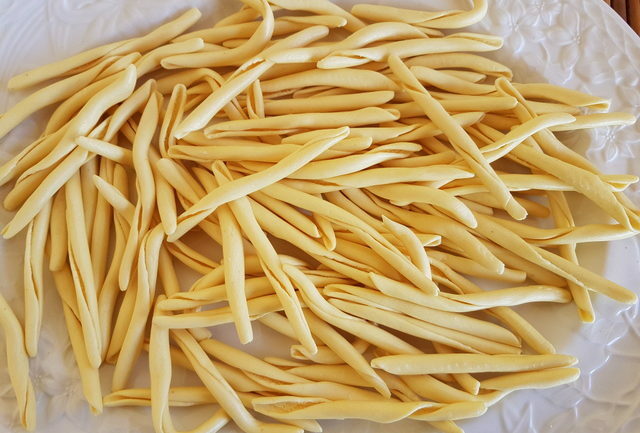 In fact, most fresh pasta in Calabria is made without eggs. After the dough has been kneaded and left to rest for at least 30 minutes the fileja are made by rolling out small balls of dough into ropes of about 2-3 ins in length and then rolling these ropes by hand around a wooden or metal stick called a ‘danaco’ or ‘dinacolo’. The dough is wrapped around the stick to resemble an ‘esparto’, a cord-like tough grass that grows wild and is used to weave baskets in many parts of the world! Fileja can be made or bought in different colours! Today you can, of course, buy this pasta ready-made (dry or fresh) and I’ve even seen ‘flavoured’ versions such as ‘chilli fileja’. However, I think I prefer the unflavoured version. I’d rather put the chilli in the sauce! 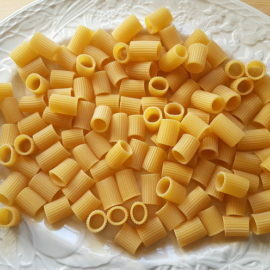 If you like making your own pasta you can also try your hand at making these. There are a number of videos on YouTube showing how it is done like this one. A thin metal or wooden skewer or even the long side of a metal coat hanger, which has been cut off, can be used instead of a dinacolo. 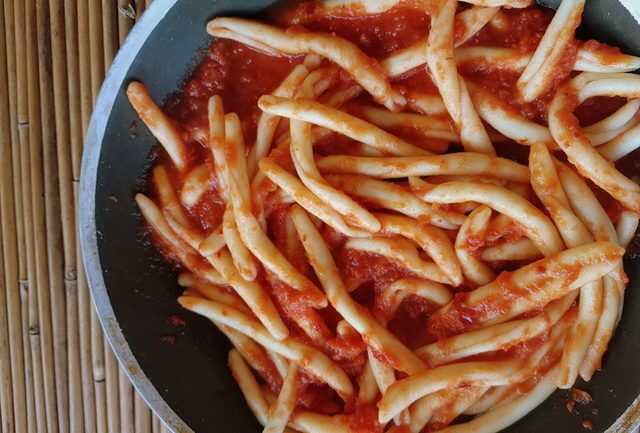 Fileja are often the pasta of choice for typical Calabrian recipes on Sunday or holidays. Most typically they are eaten with a minced pork sauce or a simple tomato sauce or, for lovers of spicy dishes, flavored with Calabrian ‘Nduja’. 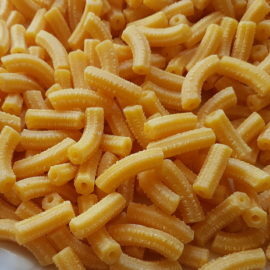 However, there are lots of other very interesting and unusual Calabrian pasta recipes for this type of pasta. I plan to be sharing many of them with you in the not too distant future but the first one you can try is Fileja Tropeana a tasty but simple vegetarian dish made with zucchini, aubergines and tomatoes. I think THIS is the pasta I have been searching for… for years! 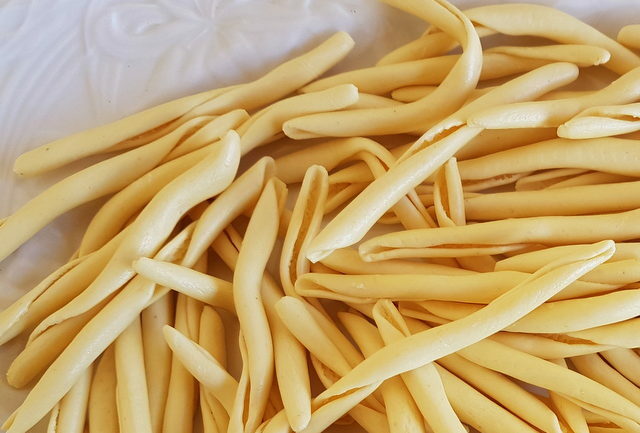 I had a chef who worked in Paris, Spain and Italy make some pasta for me that looks like this and I have been searching for the name since then. Is there one just like this without the groove. I am not sure if I remember a groove. Your blog is such a useful resource!. Again, I am thrilled we discovered you!